Consumer unit - also known as a fusebox, consumer control unit or electricity control unit. 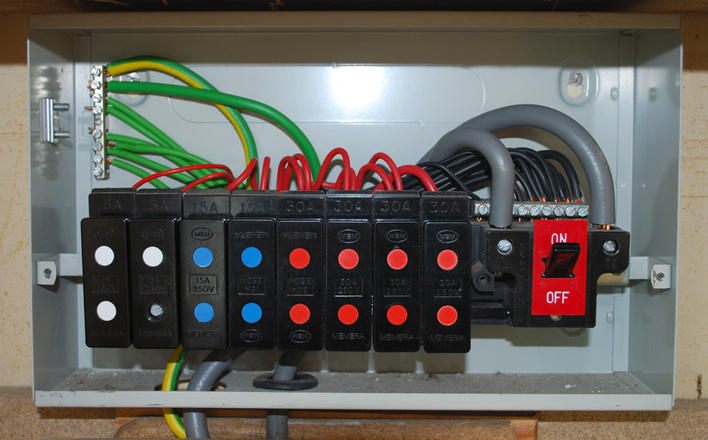 This is a distribution board for controlling and distributing electrical energy, mainly for domestic properties. Electrical Installation Condition Report (EICR) - formerly called a Periodic Inspection Report (or PIR). This is a report on the overall condition of all the electrics in a building. It will say whether it’s satisfactory for continued use and explain any work that might be needed. Part P - part of the Building Regulations requiring consistent standards for buildings including structure, fire safety, sound insulation, drainage, ventilation and electrical safety. Reasonable provision must be made in electrical installations to protect anyone operating, maintaining or altering the installations from fire or injury. Overcurrent - when the electrical current (in amps) exceeds the maximum limit of a circuit. Heat generated by overcurrent can result in risk of fire or shock from damaged insulation. Portable Appliance Testing (PAT) - the required inspection and testing of electrical equipment including portable appliances, moveable equipment, hand-held appliances, IT equipment and extension leads. If you would like to know more about these or any other electrical terms, please get in touch.